This Hungarian Esterházy Torte recipe is very popular in Europe. 5 thin layers of almond and hazelnut meringue, filled with kirsch custard buttercream, spread with rum apricot jam and glazed with sugar glaze. 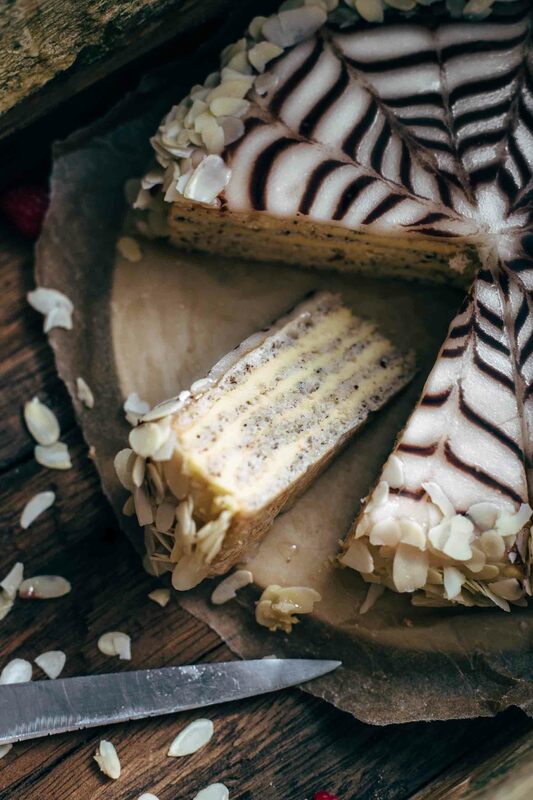 Watch the video to see how to make this beautiful Esterházy Torte with its characteristic Esterházy chocolate striped pattern. Even if I love to experiment and create new recipes, I also love to share classic European recipes with you which are fully translated from the original language into English. 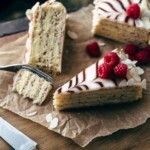 This Hungarian Esterházy Torte recipe is an original Hungarian recipe. Esterházy Torte was invented in Hungary and is now very popular in Hungary and Austria. You see it in every good Austrian pastry shop and is in Austria as popular as Apfelstrudel, or Black Forest Cake. Start with the filling. The filling is beyond delicious and can’t be compared to any other filling. Cook egg yolks, cornstarch, sugar, and milk until thick. The consistency is firm but creamy. Then let the custard cool for about 30 minutes. Then beat butter until soft. Add cooled custard gradually. In the end, add vanilla and kirsch. Just a few ingredients and easy to make but the flavor can’t be described with words. Just out of this world delicious. The kirsch can be replaced by rum. But when kirsch is available where you live, I encourage you to go with kirsch instead of rum. It gives the custard buttercream a very special flavor. 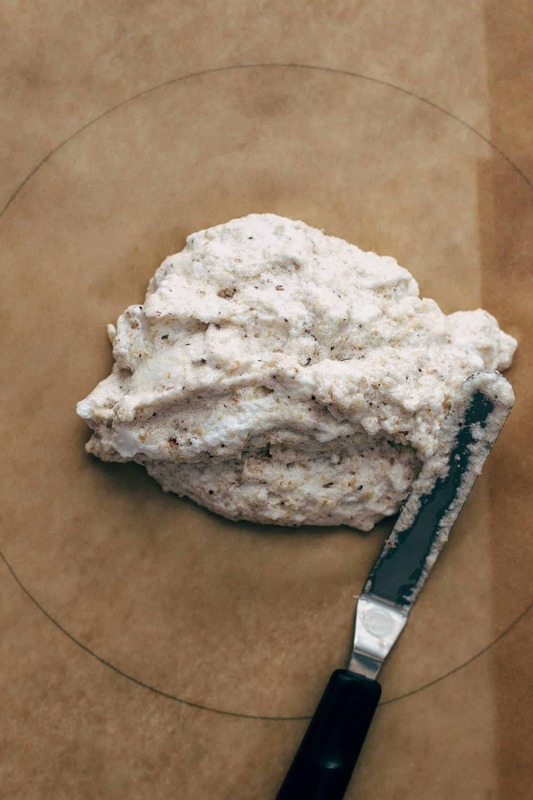 While the filling is cooling, start with the almond and hazelnut meringue. For the meringue layers, you just need to whisk egg whites, sugar, and salt until stiff and glossy. Then fold in ground nuts and flour. Be careful and don’t overwork the meringue that you don’t lose all the air. The meringue is, when it is baked, light and airy with a strong nut flavor of almonds and hazelnuts. Then draw with a pencil five 9″ (23cm) circles on parchment paper. Flip over the paper (because we don’t want to have the ink on our meringue) and spread the batter into the drawn circles thinly. Bake one after another for about 10-12 minutes until dry, puffed, and lightly browned. Assemble the five meringue layers with four custard buttercream layers and finish with a meringue layer on top. Spread with the rum apricot jam and chill for 30 minutes. For the sugar glaze, stir powdered sugar, water, and corn syrup to combine. The original version is not using corn syrup but vegetable oil. I used corn syrup because I wanted to have the glaze extra soft and shiny. Warm the glaze in the microwave until it has a temperature of 80-85°F. When the glaze is cooler, it is not spreadable enough, and when it is warmer, it is too runny. Pour immediately on top of the Esterházy Torte and draw a thin wheel with chocolate on top. With a toothpick alternately draw 8-9 lines from the center to the edges and the same from the edges to the center. Use dark chocolate for darker coloring. Cover the sides with almond slices. Congrats! 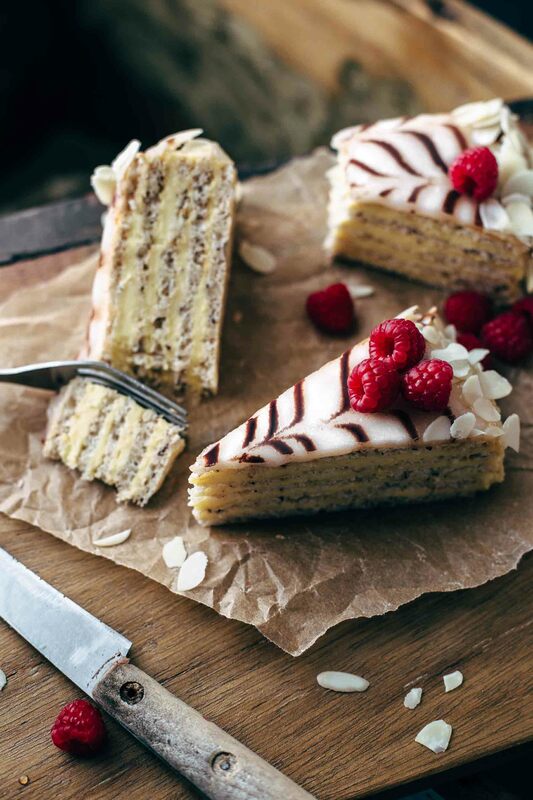 You’ve mastered a traditional Esterházy Torte like from an Austrian pastry shop. Your friends and family will be impressed by the look and the taste of this cake. I hope you enjoyed baking like a Hungarian or Austrian. 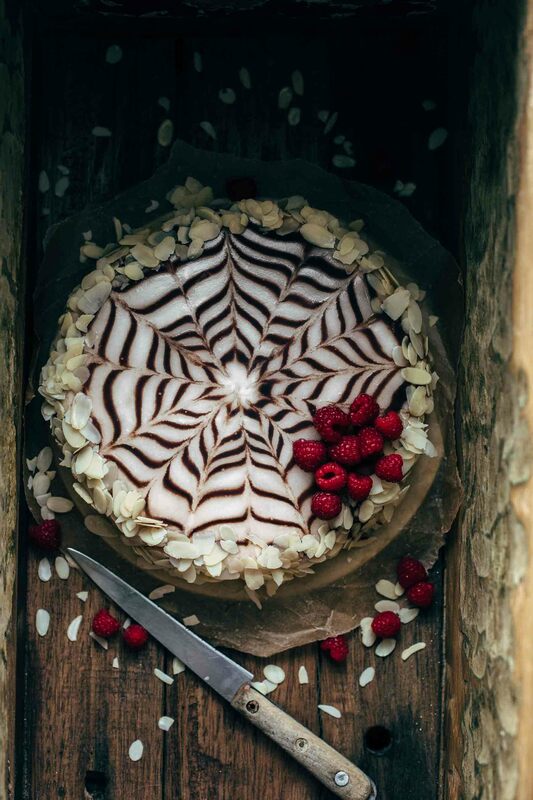 If you make this Hungarian Esterházy Torte recipe, leave a comment, rate it and tag a photo #alsothecrumbsplease on Instagram! Would love to see your snap! Start with the custard: Combine yolks, cornstarch, and 3/8 cup of milk in a bowl and stir to combine. Bring 1/2 cup of milk and the sugar over medium heat to a boil until the sugar is completely dissolved. Stir constantly. Slowly pour hot milk into the egg mixture. Stir to combine. Return to the saucepan and cook until thick for about 2 minutes. Stir continuously. Remove from heat and transfer to a bowl. Cover with plastic wrap to prevent it from forming a skin. Chill 1 hour. Make the meringue layers: With a pencil, draw five 9 inches (23cm) circles on parchment paper. Then turn the parchment paper upside down and place on baking sheets. Preheat oven to 350°F (175°C). Combine nuts and flour and stir to combine. Set aside. In a large mixing bowl with a handheld or stand mixer fitted with a whisk attachment, whisk egg whites and salt on medium-high speed until soft peaks form. Add sugar and whisk until glossy and stiff peaks form. Fold in dry ingredients carefully. Equally spread the batter into the drawn circles. Make sure that they are all the same in size and thickness. Bake one layer at the time for 10-12 minutes until golden brown. Remove from the oven and immediately flip over the parchment paper and remove the paper. Cut the edges evenly that all layers have an even round 9“ shape, if necessary. Let cool to room temperature. 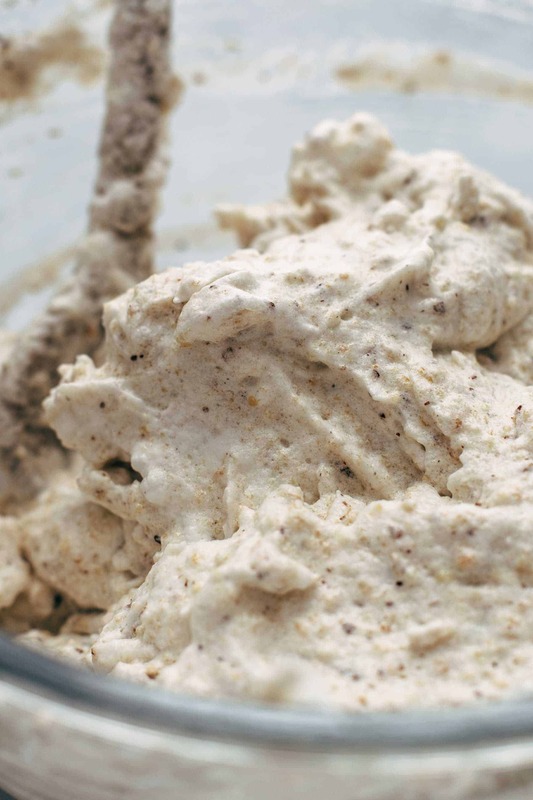 In a large bowl beat butter on medium-high speed until creamy. Add custard little by little and stir to combine. Add kirsch and vanilla* and stir until fully combined and creamy. Combine apricot jam and rum in a bowl and stir until smooth and combined. Set aside. Assemble the cake: Place a 9" spring pan ring on a cake board or cake stand. Place the first meringue layer inside the ring and spread with ¼ of the custard buttercream filling. Repeat until you end up with 5 meringue and 4 cream layers. Finish with the most beautiful meringue layer on top, smooth side up. Spread apricot jam on top evenly. Chill for 30 minutes. Place melted chocolate in a zip-lock bag and cut off a tiny edge of the bag. The chocolate line what we later draw on top of the cake should be 0.04 inches (1mm) thick. Set aside. Make the glaze: Combine sugar, water, and corn syrup and stir to combine until smooth. Microwave a few seconds until it reaches a temperature of 80-85°F (26-29°C). Immediately pour on top of chilled Esterhazy Torte. If the glaze is too runny, let stand for a few minutes. If it is too thick, microwave a few more seconds. Let drip over any excess over the sides. Pipe a chocolate wheel on top beginning from the center to the edges. Alternately run the tip of a toothpick from the center to the edges and from the edges to the center, 1 inch apart. You will have about 8-9 lines in each direction. Cover sides with sliced almonds by pressing them against the sides with your hand. Chill in the fridge in an airtight container for 4 hours and store leftovers up to 3 days. And this recipe is exactly why I check your website every single day, Sabine. This is INCREDIBLE! You are a Michelangelo-esque architect of all things sweet and delicious. I never heard of this dessert before so I did some googling and found others used a chocolate filling, but your creation is utterly peerless–it stands alone in beauty and creativity. 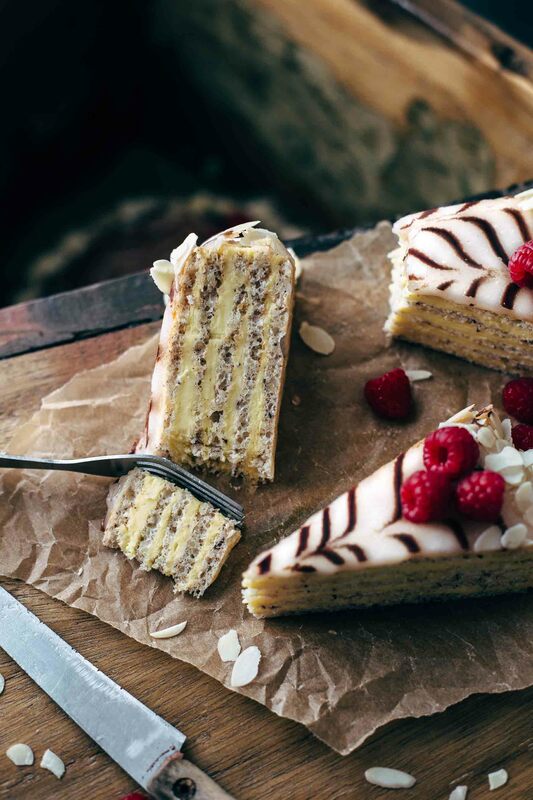 The video, the fork so perfectly slicing through the wedge of torte, the texture of the filling, the sprinkling of almonds…it is all a beautiful masterpiece. I could never create and offer up such a gift to this world. Simply marvelous. Amanda, you are so sweet! It touches me deeply that you like my blog and my recipes. Thank you so so much from the deepest of my heart. This is the original filling and recipe from Hungary. A chocolate filling is not original but sounds delicious as well. I can say, that this kirsch custard buttercream is very special and I know no other cake that has a similar filling. If you make the recipe and need any help, just let me know. I’m always happy to help! This is so beautiful! It sounds a bit like a project, but worth the effort! Melissa, it’s absolutely worth to try it. It’s a very special and super delicious cake. Thank you so much, Ralu! Unfortunately I tried my hand at this dessert looking for something different for this Christmas. It didn’t turn out at all. My sponge stuck to the parchment and tore apart and when I added the kirsch to the buttercream it curdled and could not be saved even after minutes of beating. My ingredients were at room temp so not sure what happened there. All in all pretty disappointing, was really hoping for this one to turn out. Best of luck to others who attempt this! I’m sorry that you had troubles with this recipe. It’s indeed not the easiest cake to make, but with following every step accurately, you shouldn’t have faced such problems. To watch the video is always good to see how the consistencies look like. That the meringue stuck to the paper and didn’t go off there is just one reason. It was still too wet and not baked through. The meringue needs to be golden brown and easy to remove from the paper as you can see in the video. Some reasons come to my mind why this could happen. 1. Every oven is different. Maybe mine is more powerful than yours, and you need to add another 2-3 minutes to get the same results. An oven thermometer is a great investment. 2. The baking time also differs when eggs are larger (not every egg is the same). So when there was more wetness, it also takes a bit longer to dry and bake through. 3. Please make sure to measure all ingredients correctly. 4. The circles must be 9″ (23cm). 5. The meringue needs to be very stiff that you could cut it. That the custard cream curdled could be following reasons. 1. Make sure to mix the butter until it is creamy until you add the other ingredients. 2. The custard was not cooked enough or overcooked. As you can see in the video, it needs to have a firm pudding-like consistency. 3. The custard was not cold enough. I know you said it was room temperature but when it was still warm to touch it was maybe still too warm. 4. Adding the custard little by little and mixing until it comes together, then adding the 2 tbsp of kirsch (is really not much liquid though) and mixing should turn out fine. Normally, it comes together almost immediately after adding the liquid. I hope that helps! If you need anything just let me know. I’m always happy to help!